Most people would panic if they saw a car cruising down the street without a driver at the steering wheel. But brace yourselves—driverless cars will become a common sight in the near future as the technology for autonomous vehicles (AVs) improves. At the launch of the Centre of Excellence for Testing and Research of Autonomous Vehicles–NTU (CETRAN) in November 2017, Singapore’s Transport Minister Mr Khaw Boon Wan announced that Singapore would be stepping up efforts to deploy AVs on its roads. Already, autonomous shuttles are plying routes in Nanyang Technological University, and driverless nuTonomy taxis are ferrying passengers around the one-north district, a designated testbed for AVs. 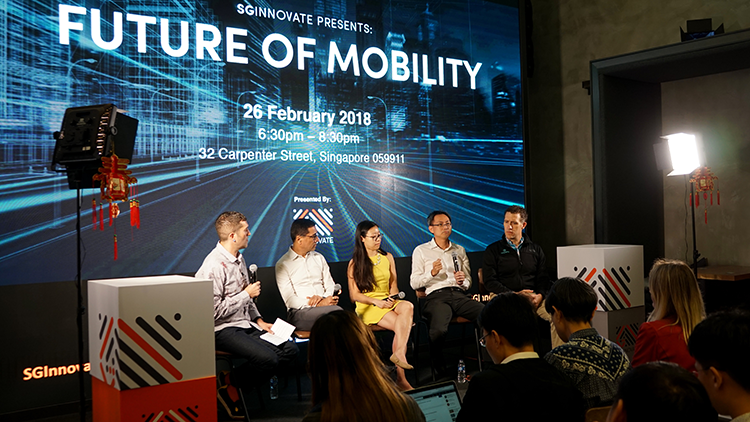 The era of AVs is upon us, bringing with it a host of promises and perils, many of which were raised at SGInnovate’s Future of Mobility panel discussion, held on 26 February 2018. Moderated by Mr Michael Smith Jr, partner at venture capital firm Seedplus, the panel consisted of Mr Doug Parker, COO, nuTonomy; Mr Lam Wee Shann, group director, technology and industrial development, Land Transport Authority; Ms Annabella Ng, government affairs lead, Grab; and Mr Mahesh Tanwani, director of engineering–automated driving at automotive parts technology company Aptiv. Moving people around can be a challenge in land-scarce and population-dense Singapore. This means that the strategic deployment of a variety of transport systems is essential, and AVs are expected to complement existing modes of transportation. “Trains with a carrying capacity of 1,500 passengers can easily move large crowds of people, but AVs can play a very crucial part as well. For example, high-capacity AVs can ply fixed and scheduled routes during peak hours and provide mobility on demand during non-peak hours,” said Mr Lam. This means that transport networks can become more flexible and responsive to commuters’ needs. 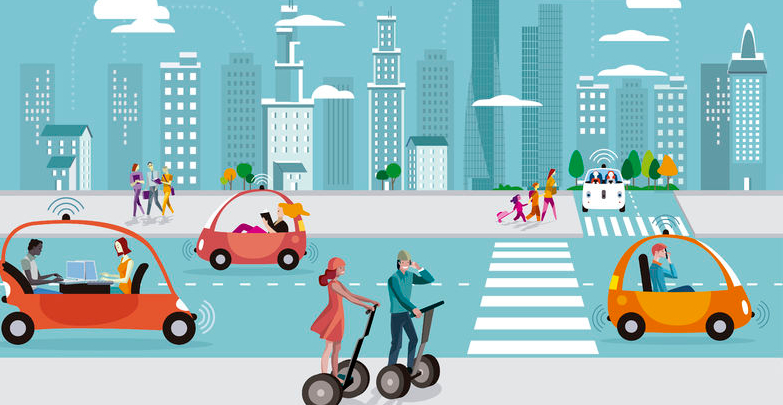 Agreeing that the integration of various transport networks is key to successful urban mobility, Ms Ng noted that the ideal scenario would be for Singapore residents to be able to complete a single journey using multiple modes. AVs would be particularly useful for solving the first-and-last mile problem, wherein passengers need to travel a short distance to the nearest transit station, for instance, from their homes to the MRT station. “One of the biggest complaints we get from customers is that drivers don’t want to pick them up for short trips, and this is because the driver doesn’t feel the journey is worth it,” explained Ms Ng. AVs can help bridge this gap in demand and supply, she said. In addition to matching demand with supply, another compelling reason to use AVs is that they lower the likelihood of accidents due to human error. According to a McKinsey report, traffic accidents could be reduced by 90 percent when AVs become the primary means of transport. Nonetheless, Ms Ng thinks that AVs will not replace human drivers completely, which means that AVs must be able to respond to the actions of human drivers and pedestrians to avoid accidents. AV trials should therefore reflect the reality of a mixed traffic environment, she said. LTA’s Mr Lam explained that the AV testbed at one-north is an ideal location for carrying out such realistic trials. “The traffic on those roads is relatively light, but there are all kinds of traffic situations, such as jaywalkers, traffic junctions, non-signalised junctions, personal mobility devices such as motorised scooters, and pedestrians,” he said. To enable AVs to react to myriad traffic scenarios, technical expertise is required to optimise sensors and operating systems. Above all, the safety of passengers and other road users must be assured, said the speakers. “Safety has to be submersed and built into the design of the vehicle, from the hardware to the coding practices and down to the software that executes the checks and balances,” said Mr Tanwani. Mr Lam added that as an additional safeguard, LTA requires each AV on trial to be accompanied by a safety driver to quickly take control of the vehicle should the need arise. But beyond ensuring the intrinsic safety of AVs, AV manufacturers must also defend their vehicles from external threats such as hacking. In an era where cyberattacks are rampant, the cybersecurity of AVs cannot be ignored. “Some networks, such as Wi-Fi, are known to be vulnerable to cyberattacks, so our AVs never use Wi-Fi. Also, when we design the software, we incorporate what we call a hardware trust anchor, where the password is not embedded in the programming code, but rather exists in the hardware chip,” said Mr Tanwani. This makes the software of AVs more tamper-resistant. Given the multifaceted and complex nature of the tasks of improving AV technology, keeping systems secure, and ensuring passenger safety, no single organisation can cover all bases. Hence, collaboration between the public and private sectors is key to realising the full potential of AVs, said the panel.